Private Estate w/ Casita nestled on a flat 1.06 acres in the coveted hills of Del Mar. Elegant & fully equip w/ smart technology & the luxury of all your favorite amenities incl movie theater&gym, this home will fulfill your everyday needs as well as all the comforts of home. Light&bright featuring over-sized gourmet kitchen_soaring wood beam ceilings_master bed retreat suite_& the perfect outdoor environment for entertaining-pool/spa/BBQ/fireplace/outdoor bath/ bocce ball court, RV parking & so much more, Private Estate Home with guest house nestled on 1.07 usable acres in prestigious Rancho Del Mar.Â The perfect fit for any family size, this beautifully maintained home is full of charm, elegance, practical living space, and many pleasant surprises along the way.Â Fully equip with smart technology features throughout, in addition, the luxury of all your favorite amenities such as movie theater and gym, this home is sure to fulfill your everyday needs as well as welcome you to all the comforts of home. From the gorgeous-ambiant light fixtures to the lushly landscaped grounds, this home is flooded with natural light and completely turn key featuring, an accommodating floor plan with multiple entry level en suite bedrooms/optional rooms, security system, an unexpected-quaint inside/outside entry courtyard, LED lighting throughout, beautiful stone and hard wood flooring, surround sound, 80 solar panels owned outright, a massive gourmet kitchen that will have you feeling inspired, complete with butlers pantry-Viking/Dacor appliances - Sub-Zero refrigerator - and breakfast nook,Â soaring wood beam lined ceilings, master bed retreat suite complete with private secondary entrance - separate den - viewing balcony - massive his/hers walk in closets - marble appointed master bath with steam shower, Toto bidet, elegant soaking tub, and so much more!Â Indulge your favorite guests in the perfect outdoor setting with all the best amenities, pool - spa - full outdoor bath - barbecue - fireplace - and bocce ball court! Also enjoy the convenience of having a separate, private entry Guest House. 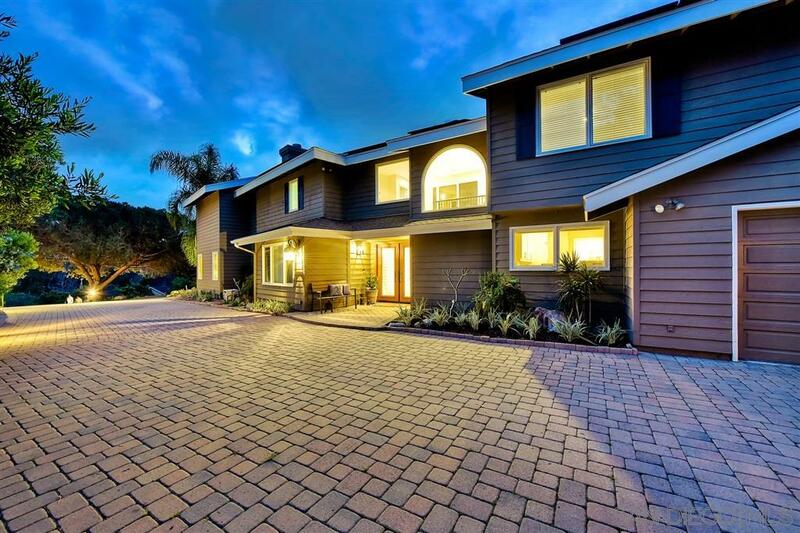 Last but certainly not least, the location is as good as it gets- privately nestled in the highly coveted hills of Del Mar, just minutes from the beach, several shopping areas- Cedros shopping district, and the best rated schools in San Diego- Solana Beach and San Dieguito Union School District. RV parking with offstreat entry and hiking trails border the property of which you have your own direct access.Â A truly unique, inspiring, and very special opportunity!